After the foundation, the masonry work on your new home or commercial project is the next most important thing. 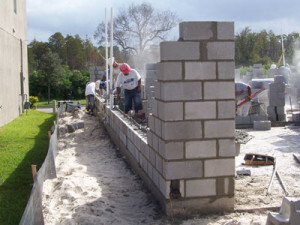 DeWitt Custom Concrete provides the finest masonry work in the Central Florida area. With over 30 years of experience, you can count on our expert professionals to produce the quality result you are looking for! Our masonry team is fully integrated with our concrete management team, to provide you with seamless project management and a superb building. Contact DeWitt Custom Concrete today for a free quote on your next commercial or residential project.